But that’s not all, in addition to its massive 50-lane bowling alley (expanded from 32 lanes after opening), Covina Bowl had a diner, a cocktail lounge, banquet rooms and much more. In fact, when this joint opened sixty-two years ago at 1060 W. San Bernardino Road in West Covina, it was one of the most glorious bowling centers in its heyday; an exciting Googie showpiece and entertainment palace for the whole family. 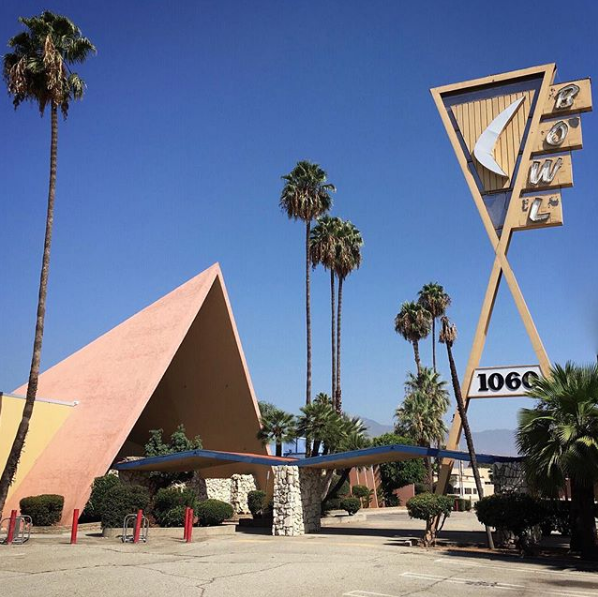 The bowling center’s 60 foot tall hourglass-shaped sign represents classic Googie design. Photo courtesy of Ken MacIntyre. Flagstone cladding, Mayan-style textile blocks and a folded plate roof porte-cochère greeted guests at the bowling alley’s main entrance. Photo courtesy of Ken MacIntyre. 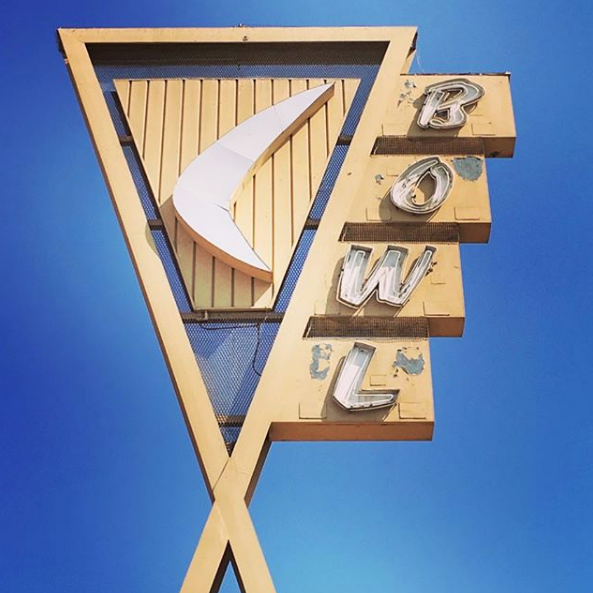 Despite an outcry from a small but devoted fan base (Friends of Covina Bowl), The Covina Bowl was shuttered in early 2017 after many years in decline and is currently a time capsule awaiting rescue. The building is eligible for placement on the National Register of Historic Places, meaning it could still escape the wrecking ball in one form or another.